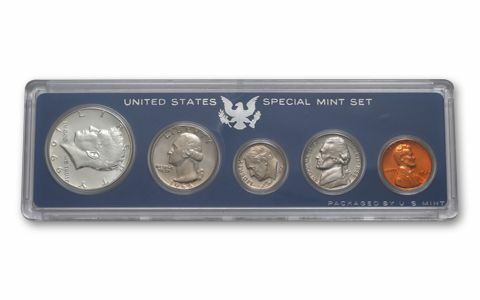 While the Treasury waited to declare the coinage shortage over, the Special Mint Set program was continued for another year. Sales dropped slightly, indicating the collecting public's dissatisfaction with the product. 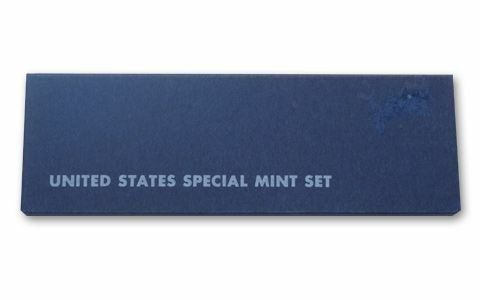 Orders for the 1966 Special Mint Sets were limited to 25 sets per person. About the sets: All of the Special Mint Set coins were struck at San Francisco on old presses obtained from the Ordnance Department, but without an identifying mintmark. In 1966, the initials "FS" (for the designer, Felix Schlag) were added to the obverse of the Nickel. Two Proof Nickels were struck in 1966 (most likely in Philadelphia) and presented to Schlag. Their whereabouts are unknown. Some 1966 Special Mint Sets may contain a very scarce, but spectacular Doubled Die Obverse Half Dollar (examine "IN GOD WE TRUST", Kennedy's chin, nose, ear and eye.). Another very rare Half Dollar is found with the designer's initials (FG) missing on the reverse, due to excessive polishing of the die. Most 1966 SMS coins have a brilliant finish. Cameo surfaces are rare in Nickel and Half Dollar and very rare in Cent, Dime and Quarter. Deep Cameo surfaces are extremely rare (the Cent and Dime may not exist as Deep Cameo). 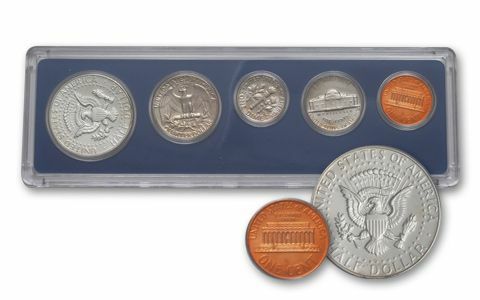 Each set contained five coins: Lincoln Cent, Jefferson Nickel, Roosevelt Dime, Washington Quarter, and Kennedy Half Dollar. 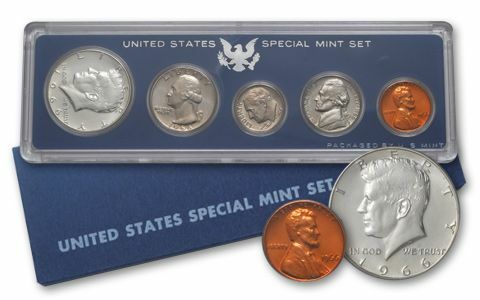 Original packaging: The coins in Special Mint Sets were housed in a clear plastic holder made of two pieces that snapped together. Each coin was held in place by a raised ring of plastic. A thin sheet of blue plastic, with cutouts for each coin, provided a background. Each holder was placed into a cardboard slipcase. Race riots and anti-Vietnam War protests erupted throughout America. Walt Disney died of lung cancer. Betty Friedan founded the National Organization of Women. India and Pakistan fought a short, undeclared war over the disputed area of Kashmir.